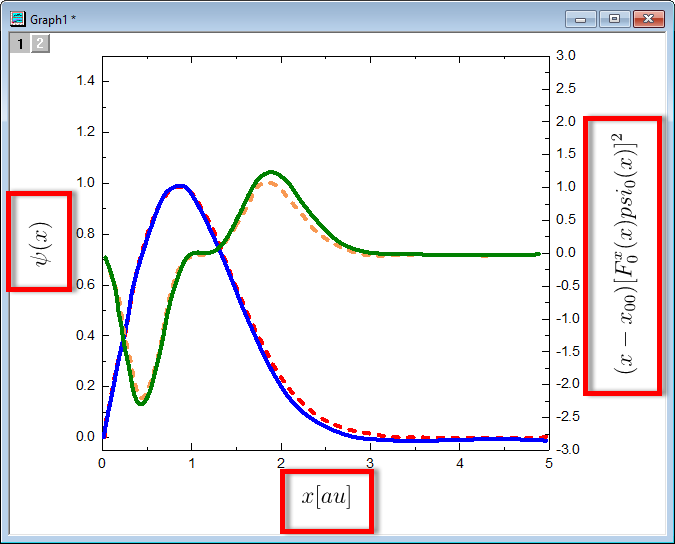 In this blog post, I’ll highlight how to add LaTeX objects to all three of those areas. If you wish to see the end result of what will be presented, you can download a sample project here. 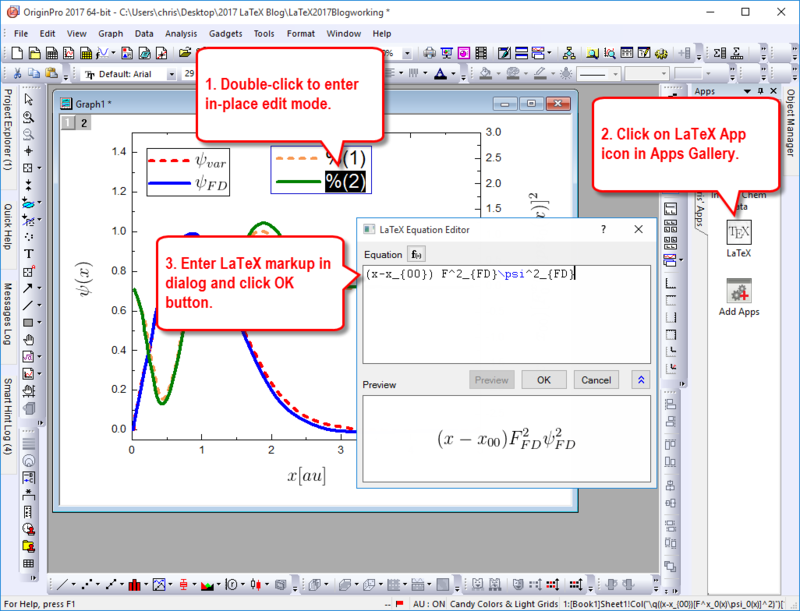 Note you must be running Origin 2017 and download and install the latest version of the LaTeX App (along with MiKTeX and OAutotrace if not already installed). Once again, Let’s move on to the next subject. Lastly, I will explain how to add LaTeX objects to graph Legends. In much the same manner that LaTeX objects can be used for axis titles, they can be used for legend entries. 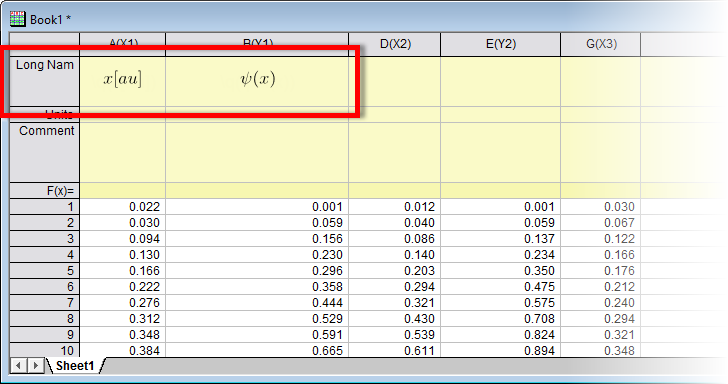 In the example below, I have entered a few escaped LaTeX markup strings into the Comments column label row cells. When I add the two Legends to the graph, the default Legend Translation Mode picks up on the escaped LaTeX and renders it into the legend. 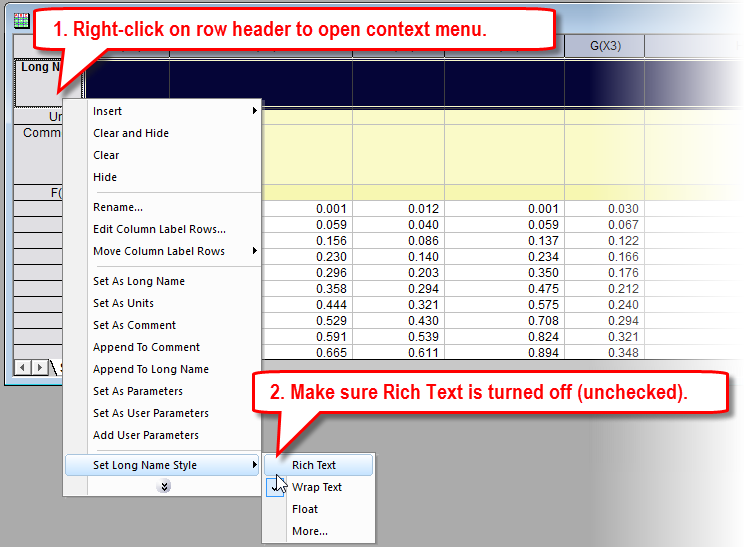 Note how I did not turn on Rich Text in the worksheet cells and yet the Legend still renders the LaTeX! 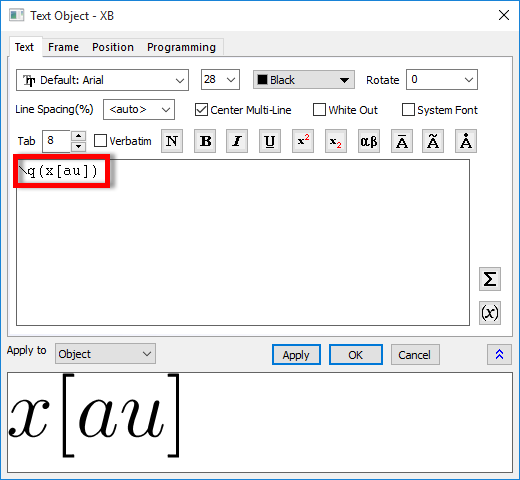 I hope that this blog post has helped illustrate the new possibilities for using LaTeX objects in various places in Origin 2017. 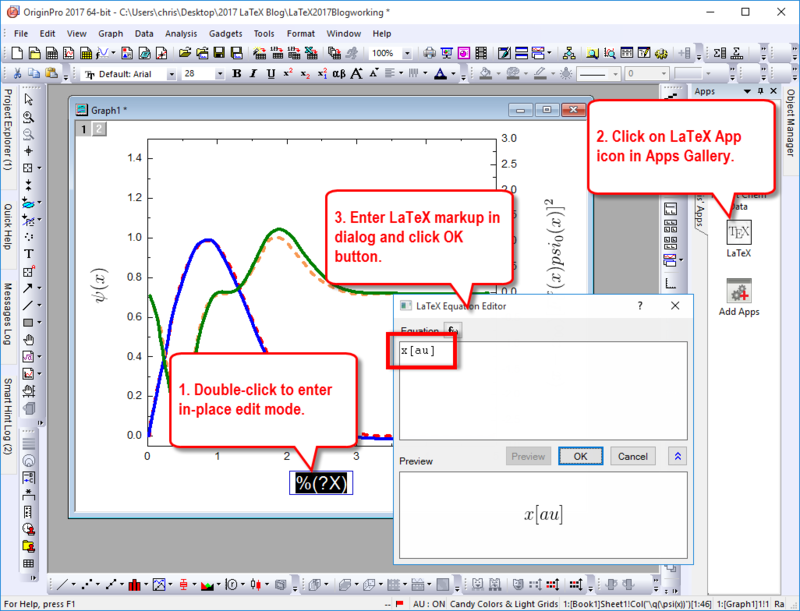 If you are a LaTeX fan and are not using Origin 2017 yet, consider downloading a demo from our website or contacting us to discuss how you can get the latest version. Hi! I’m Lerh, a Chinese student. Recentely , I found that Origin can work with LaTeX! Everything is fine when I type English and equations. I tried to use ctex and I already downloaded CJK packages,but failed. The document header may not be using recommended 12pts fonts. The font size combobutton may not work properly. Could u please help me to solve this problem? Thank you for bringing this up, we will discuss with our developer to see if it’s easy to implement. It’s an owesome app! Everything is fine with English and equations. But how should I type Chinese via this app? I tried to use the package-CJK. But it’s failed. Can u help me with this problem? Many thanks. I was briefly able to get the following snippet to generate Chinese characters but it seems buggy and not reliable with the App. 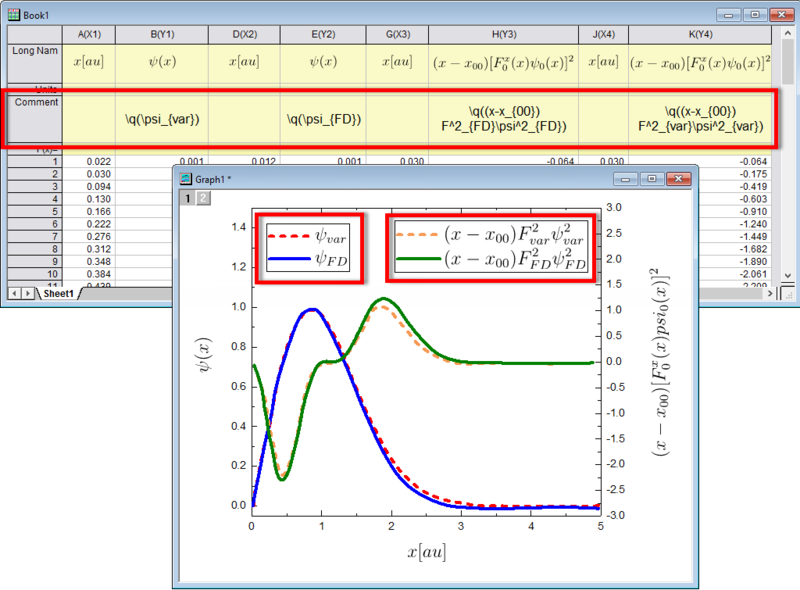 But actually the App is designed primarily for equations and not normal text (despite what is possible with normal LaTex), so I am not sure that we can do anything about it. BTW- starting with Origin 2018, you can create graph annotations in chinese directly through standard keyboard input. How to combien the MIKTEX and the origin2017, I can not solve it successfully. Please following the instruction on http://www.originlab.com/fileExchange/details.aspx?fid=221 to install it. It should work for Win10 as well. Did you install MiKTeX and OAutotrace mentioned on the file exchange page? And did you check if your Origin is higher or same as the required minimum version? Is there any way to change the default font used by LaTeX, perhaps by changing the default statements that are automatically wrapped around the input? Also, when attempting to change the font by inserting a complete LaTeX document the created object is very long with a black streak down the middle. Any suggestions? For the “black streak down the middle”, would you please share us the LaTeX strings or a screenshot of the APP dialog? Then, we can try to reproduce the problem here. You can reach us via emailing to tech@originlab.com too. Could you elaborate on that topic? When I use your code and change from 12pt to 18pt I get an error message. 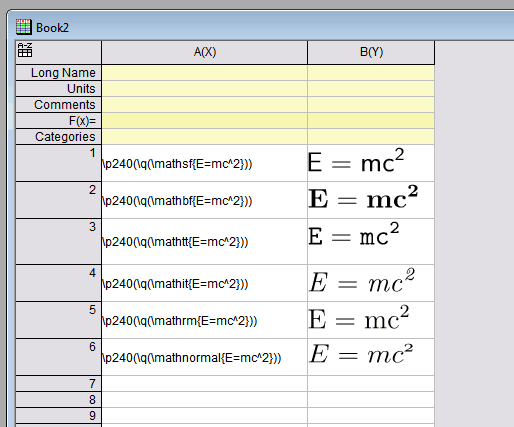 How would I display \q(E=mc^2) with Origin default font, bold and 14pt? Sorry, our LaTEX app is not very complete to fully support all fonts. For your case, I have created some examples to set font and font size in Origin, please try them to see if you can get what you want. You can refer to this page to learn how to change the font size using the text formatting commands. 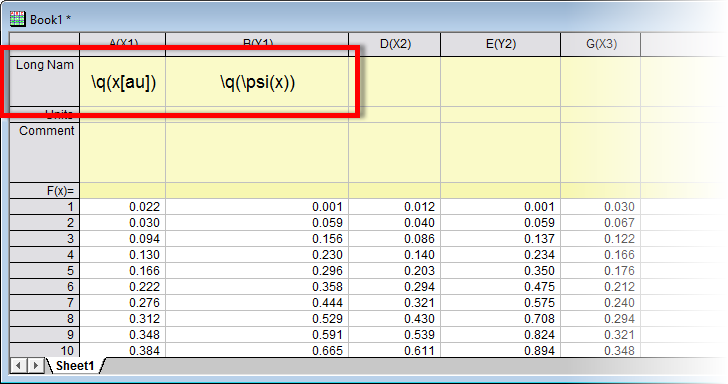 Everything works as stated but when I add \q(\psi) to a cell and turn on Rick text, there is a delay as if though the software is chugging away, but the symbol does not show up. BTW ever other feature works as promised. I’ll contact you via email!